I made a dent in my scrap bin! Yeah right. 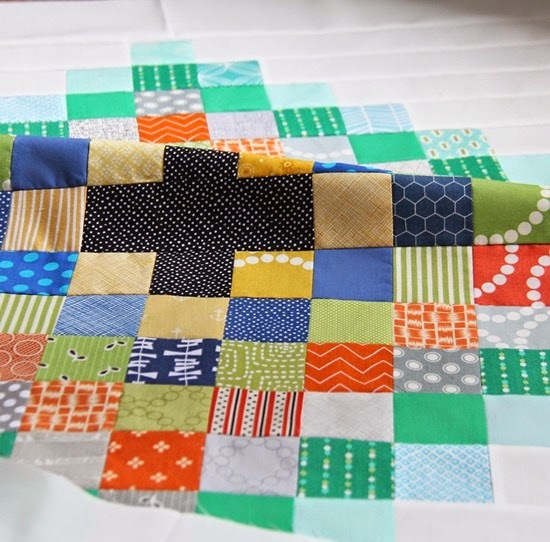 But I did put some of my scraps to use and made this quilt…aptly named after our street. You know you’re out of clever quilt names when you start naming them after streets. This one is about 44” square. A perk of having my 7 year old home all summer is he can hold up quilts for pictures…and he’s easily bribed with gum. I drew this one out in my old school graph paper notebook. It’s still the best way to play with ideas and figure out patterns. :) If there’s interest I’ll post my measurements when I finish the quilt…I think it makes such a unique/modern baby quilt! I would love to have the measurements! I'm doing a very similar design as my very first quilt! Will be lovely to see more of this one as you do it, it's beautiful. Un quilt molt bonic, els colors son perfectes !! Oh yes – please share your measurements. 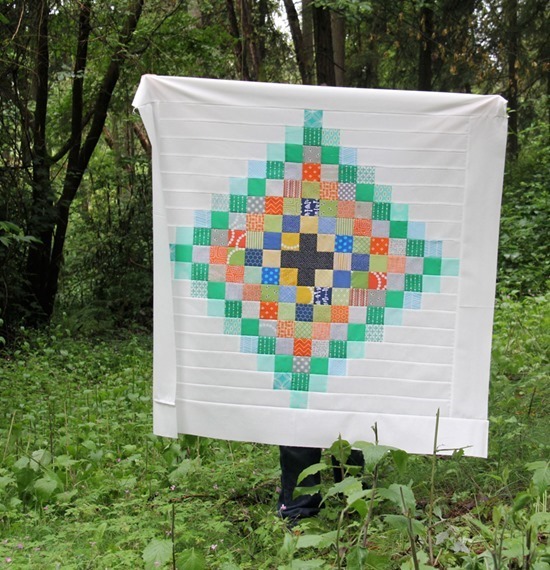 This quilt is just stunning. The idea that we can actually use our scraps is a bonus! Thanks. Love this one. And the name. Looks kinda like a dream catcher. Hehe! You had me at the bribing your 7 year-old (I do the same with my 6 year old), and using your graph paper (I love doing that too…). Cute quilt! A stunning quilt. Will watch for more details. You get off lucky with a gum bribe. Love it and would love the measurements! Very pretty and yay for using the scraps! I really like this one! I'm working on three of your quilts right now for my boys… Busy Kid, Touchdown and the Squares and Stripes patterns… just realized the other day that everything I was working on was yours and realized I just finished an easy bake quilt about a month ago….All this to say that I just love your work! and how it is truly uniquely you and it inspires me! thank you! Please share,as I just found out about a new babe coming for some friends, and this would be great.It looks great, by the way. Love your quilt! Would love to have either a tutorial for it or a pattern for purchase. I just love all of your quilts. They are fun to make and so easy to follow. This is so cute!!! and the name is perfect!!!!! GREAT JOB! Beautiful!!! Graph paper is a great way to play a bit. I need to make some baby quilts and this gives me some ideas. Thanks. I would love the measurements! What a great idea for a baby quilt. Please share the measurements for this lovely quit. Thanks! Would love the measurements also, it's great! So summery and fresh perfect scrap quilt measurements please. SUCH an awesome pattern! Think I'll be making another. 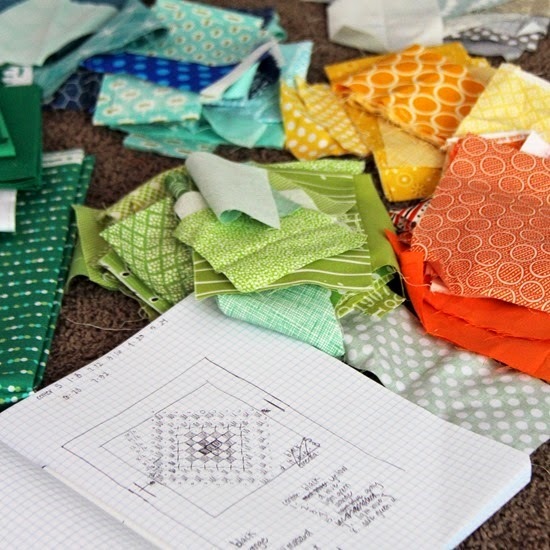 ;-) And I think I might just make this Chippewa quilt of yours using the scraps from Off Track! I love it. The colors are so pretty and the pattern just stands out. Yes please, I'd love measurements also. Love this little thing and especially since my scraps are separated by color. Would love the tutorial/measurements when you're done! Awesome quilt! Would love the measurements. I need to make a quilt by November for a new baby and this might just be the one. Love this quilt Allison….well, love all your work and one of my bucket list wishes is to meet you one day! Oh and that lemon blueberry cheesecake recipe is fantastic! Made it for Father's Day and is now our family FAVORITE! Thanks so much for posting! 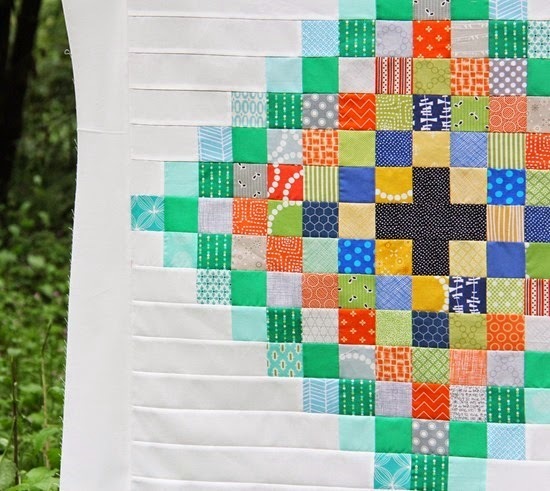 This is a beautiful quilt and a great way to use those scraps…love it! I still use graph paper, too! I find it relaxing to draw things out by hand in the little squares. Beautiful quilt! I hope you will share the measurements! This is such a beautiful baby quilt and I have so many scraps I could incorporate into a quilt like this! What a beautiful quilt! I would love to see a tutorial as well. I am really loving this quilt! Your color choices and placement are great. This is beautiful and if you would please make the pattern available I would appreciate it and would love to make it! Thanks! Super cute! Would also love a pattern for this; my scrapbin could use a good emptying lol. The quilt is fabulous. I would love to see the tutorial for this one. I really love this quilt! Love the colors, love that it is scraps, love the use of negative space. Beautiful!! Makes me want to drop everything and go quilt! I love it! I would love measurements! Allison please post the measurements! Love this!